We've been fortunate to earn the trust of a growing number of small businesses in the Greensboro area. 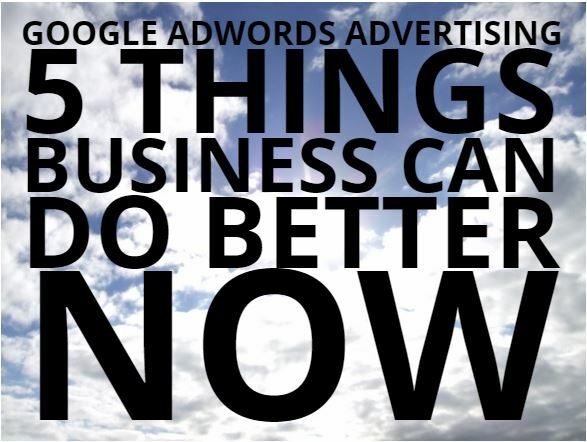 With this trust comes the opportunity to review their Google AdWords accounts. In some cases, we've made immediate impact and in others we've helped them better understand the value of AdWords and Analytics working together. We were reviewing an account of one business owner and explaining about the AdWords "Conversions" column. Goals setup in Google Analytics would flow through to AdWords so that you could better understand what was working and what was not. The proverbial light seemed to go on in their head! As a result of this conversation, the lab techs here at Why People Click have compiled a list of five things SMBs (Small to Medium Businesses) can do to immediately improve the performance of their Google AdWords accounts. Goals in Google Analytics are any meaningful action a user can take on your website. For example: FIll out a contact form, complete a purchase, sign up for an email news letter. There is good targeting available in Google AdWords and it's important to take into account both cities/states/zipcode to include as well as exclude. There are many ways to select and target keywords for your ads in Google AdWords. Some of the ways are covered in this Google support document. We generally like to see at least four ads per ad group. Why? This gives you a great way to test ad versions against each other. This is probably the post important point. After goals have been setup, targeting is correct, ads have been created it's time to monitor your account. Check that click-through rates are good and that your ad groups are delivering on the established goals.